Does a gnawing interest in product development, prototyping, additive manufacturing and flexible production continue to haunt you? 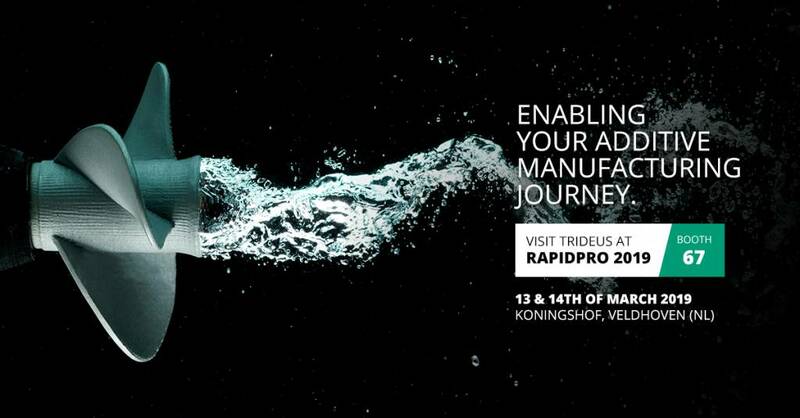 On 13-14 March 2019 you are very welcome in Veldhoven (NL) where the 9th edition of RapidPro takes place. RapidPro is thé international trade show with the largest variety of solutions for all phases of product development, prototyping and production. Trideus immerses you in the different application areas of additive and rapid manufacturing. Our experts lead you through the maze of digital manufacturing and offer you an answer to your most pressing questions. Which 3D printers do I use best in my production process? How can I reduce time and costs by implementing 3D-printing? What type of materials can I print? Through correct, personal and independent advice we come to a solution that focuses on your specific question. Not looking for a 3D-printer of your own, but very much in need of professional prints? Perhaps our printing service is what you are looking for. You deliver the design, we print! At RapidPro we show you on the basis of a few 3D-prints how we process your supplied design and provide you with the desired product. Do not miss this unique event! Especially when you are considering integrating additive and rapid manufacturing into your development processes. Trideus has the pleasure to welcome you at booth 67.